$500 Instant Savings. Expires May 2, 2019. * All prices reflect savings. What to Expect This fast-paced, locally hosted tour involves a significant amount of walking or hiking, often on uneven terrain, as well as getting in and out of boats including wet landings. Good physical fitness required to fully enjoy the trip. Ecuador is traditional villages and picturesque colonial cities nestled in the shadows of the Andes Mountains. It is the primitive rainforests and diverse wildlife of the Amazon and the windswept islands teeming with unrivaled endemic species in the Galapagos. It’s the culture of indigenous tradition and European influence that weaves its way through the food and music, the art and architecture, and the traditional Sierra way of life like the strands of a straw basket or a rushing river through lush, dense rain forest. The wealth of experiences is incredibly diverse for such a small country, and you will explore it all on our small group cruise-tour. Cruise through the Amazon basin along the Napo River, a tributary of the mighty Amazon River aboard the Manatee Amazon Explorer. Guided by an expert naturalist who knows the territory and its flora and fauna, take night walks through the Amazon, explore the river by guided canoes and kayak, search for pink river dolphins, anacondas, monkeys, caimans, turtles, manatees & more, and enjoy the amenities of your beautiful river boat. After, explore the capital city of Quito and the quaint market town of Otavalo along the Avenue of the Volcanoes. 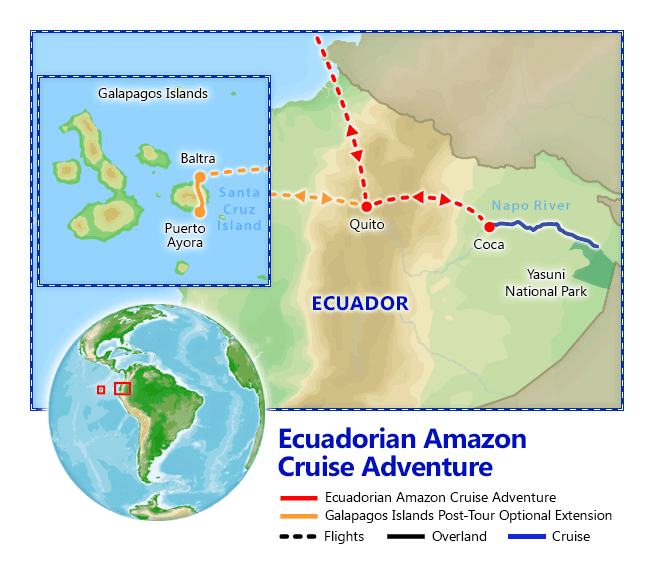 And then, why not complete your tour of Ecuador’s world-renowned highlights with an optional extension to the Galapagos? You’ll spend three nights exploring the islands and wildlife that inspired Darwin’s theory of evolution before you return home with a newfound appreciation for this South American gem, with memories that will last a lifetime and a newfound appreciation of nature at its best. Instant Savings: Get $500 off if you book by May 2, 2019! 1. Cabin upgrades are subject to availability. We will confirm your cabin selection usually within 1 business day of your reservation. 1. The Galapagos Islands extension is subject to availability and requires a minimum of 2 passengers to operate. Flights for this extension must be confirmed separately with the airlines, which typically takes 3 to 5 business days after we receive your booking, and we will notify you immediately upon confirmation. Accommodations: 1 night Wyndham Quito Airport Hotel, Quito. Full Day Itinerary: This evening, arrive in Quito (9,350 feet above sea level) and after customs formalities, you will be met and transferred by scheduled shuttle service to your hotel for check-in and overnight. Accommodations: 4 nights Manatee Amazon Explorer. Included meals: Breakfast & dinner. Full Day Itinerary: After breakfast, transfer to the airport for your short flight to the Amazon city of Coca. Upon arrival, drive to the dock and board a motorized canoe which will take you to your riverboat on the Napo River. Relax, and enjoy your first experience of the sights and sounds of the Amazon! After settling in, you will be joined by expert local naturalist guides who will provide a brief and informative introduction to the Ecuadorean Amazon. Then, you can discover the different features of the ship, such as the observation deck, where you can admire the changing rainforest landscape as you glide down the Napo River. After dinner, immerse yourself in the Amazon during a guided nighttime forest walk to observe the nocturnal activity and experience the thrill of the vivid sounds that come from such biodiversity. Full Day Itinerary: Early this morning, visit Yasuni National Park. This pristine area of the Ecuadorean Amazon is home to the legendary pink river dolphin. Other wildlife found here include anacondas, river turtles and various primate species, as well as the colorful Hoatzin, a unique species of bird. Later this afternoon, go canoeing in a black water lake, home to giant otters and the magnificent, but elusive manatee. Then, enjoy a pleasant hike in the riparian forest, for a chance to spot a flock of birds and marvel at the intricate organization of a colony of leafcutter ants by the “Giant Fig Tree”, a majestic tree that is home to an abundant diversity of life. Full Day Itinerary: Start the day by visiting an authentic local Quechua family on the banks of the Napo River. Immerse yourself in the culture as you learn about life in the Amazon directly from members of the local community. Then, return to your ship for lunch and leisure time as you sail upstream. Enjoy a cooking class with the ship’s expert chef, who will share recipes and techniques using fresh, organic ingredients to prepare delicious Ecuadorian food that you can replicate at home. You will also have a chance to try your hand at making traditional crafts. Or enjoy any of the onboard facilities: be pampered at the Rainforest Spa, soak in the scenery from the hot tub on the observation deck, sip a delicious cocktail at the bar and lounge, or just admire the sunset and the night sky from the observation deck lounge. For those looking for something more active, you can explore the surrounding nature by kayak! Full Day Itinerary: Enjoy a leisurely morning aboard your ship. Later, explore the forest on foot, discovering a myriad of plants and animals endemic to the Amazon basin. In the afternoon, visit a canopy tower built against a giant Kapok tree. This observation tower offers a glorious view above the lush treetops, offering a glimpse of the vastness of the Amazon basin. This evening, venture into the river on a canoe to search for black caimans with the help of a flashlight! Accommodations: 2 nights Swissotel Quito. Included meals: Breakfast. Full Day Itinerary: Your river adventure ends as you return to Coca by motorized canoe. 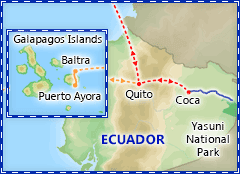 Transfer to the airport for your flight to Quito. Upon arrival, you will be met and transferred to your hotel for an evening at leisure. Full Day Itinerary: Today, enjoy a city tour of Quito. Arguably one of the loveliest of all South American cities, Quito offers a spectacular setting surrounded by mountains and several snow-capped volcanoes, including the still-active Mt. Pichincha. Begin your walking tour at the Presidential Palace. Continue to the Monastery of San Francisco, Quito's oldest church and the largest colonial building constructed in Latin America. Visit the largest neo-gothic basilica in the Americas, noted for its gargoyles in the form of native Ecuadorian animals such as iguanas, armadillos and Galapagos tortoises. The next stop, La Compañía de Jesús, has an ornate and richly sculptured facade and interior, with colored columns, 10-sided altars, and gilded balconies. After lunch, drive north of Quito to the Equatorial Monument, the Mitad del Mundo ("Middle of the World"), commemorating the exact place where Charles Marie de la Condamine established the Equator, where you can stand with one foot in the northern and one in the southern hemisphere. For those interested in seeing a spectacular panoramic view over Quito and the snow-capped surrounding volcanoes of Cayambe, Cotopaxi and Chimborazo, take a ride on the Teleférico. This gondola lift transitions to approximately 13,285 ft above sea level for a breathtaking experience. For those who opt out of the Teleférico ride, enjoy a visit to the Quito National Museum. NOTE: The Teleférico experience reaches high altitudes and may not be suitable for all passengers. Warm clothes are suggested. This evening, dinner will be at a local restaurant. Full Day Itinerary: After breakfast travel to Otavalo, the land of the “Otavaleños” Ecuadorian community where all families speak Quichua as their first language and Spanish as their second. See women garbed in colorful embroidered clothing, and men in broad-brimmed hats with blue ponchos. Explore the Otavalo Market located around the Plaza de Ponchos, the most famous indigenous market in Ecuador. The Otavaleños travel to the town to sell a multicolored variety of handicrafts including sweaters, ponchos, hats, necklaces and other handmade products. Following lunch, visit the Peguche Waterfall. The area includes a park with a hiking trail and several bridges which offer good views of the falls. Later today, transfer back to Quito Airport. Enjoy the comforts of the Layover Stay lounge before your international flight back to the USA that will depart late tonight. 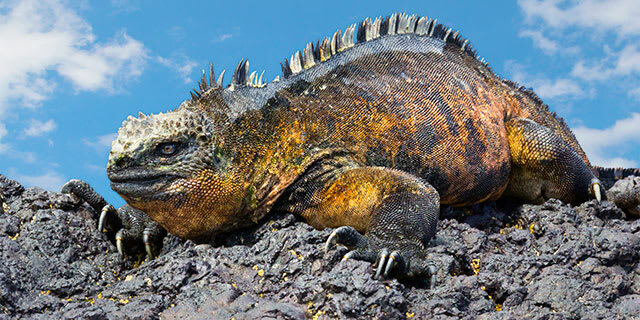 Or, take advantage of your already included international airfare and extend your trip to the Galapagos Islands. Arrival in the USA early this morning. 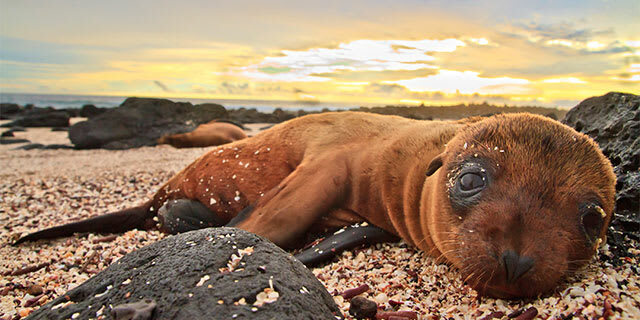 Why not take advantage of your already included international airfare to visit the Galapagos Islands, one of the world's most spectacular natural wonders? You'll return to the U.S. 4 days after the return dates shown. Accommodations: 1 night Wyndham Quito Airport Hotel, Quito. Included meals: Breakfast & lunch. Later today, transfer to your hotel near Quito Airport. Accommodations: 3 nights Hotel Solymar or similar, Puerto Ayora. Included meals: Breakfast & lunch. Full Day Itinerary: After breakfast at the hotel, transfer to the airport for your flight to Baltra, gateway to the Galapagos Islands to begin your adventure. Next, take a short ferry ride across Itabaca Channel to Santa Cruz Island, then drive through the various micro climates on your way to the village of Puerto Ayora on the south side of the island. Today you'll see Los Gemelos (The Twins), two enormous collapsed lava chambers - an awe-inspiring visual reminder of the power of nature. The path to the lava chambers a wonderful introduction to the great biodiversity of the Santa Cruz Highlands, teeming with endemic flora and fauna, including a Scalesia Forest draped in liverwort and mosses, as well as numerous birds such as Darwin Finches. 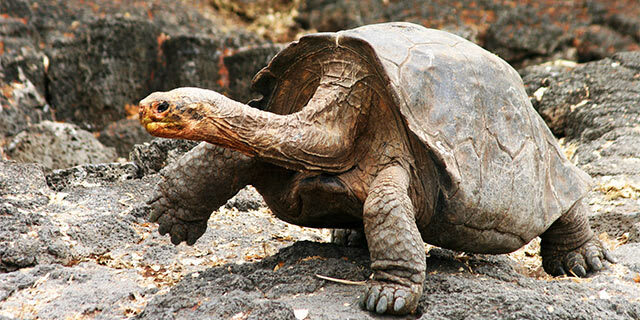 Afterward, drive to a 600-acre private reserve where giant Galapagos tortoises freely roam, graze and sleep. Feel free to mingle with these gentle giants. As prehistoric as these creatures look, wait until you hear what they sound like! Galápago is Spanish for tortoise, and the islands were named for these amazing creatures. There will be a selection of field boots for your use if conditions are muddy. Next, you'll have the once-in-a-lifetime opportunity to explore the remnants of an illuminated lava tunnel. Created by ancient lava flows, the tunnel is 1350 feet long with a ceiling nearly 20 feet high in most places, adorned with stalagmites & stalactites, mineral-colored walls, and a rippled lava floor. Visit the Charles Darwin Research Station before continuing to Puerto Ayora to check into your hotel. Full Day Itinerary: Leave your hotel early in the morning and head to Itabaca Channel to board your yacht. Depending on the winds, the trip to North Seymour takes about 45 minutes. North Seymour is a wonderful island to hike on. The island is mostly flat and arid. The vegetation consists primarily of palo santo (incense stick), cactus, and saltbush. The island is also breeding grounds for a wide variety of seabirds, including blue-footed boobies, swallow-tailed gulls, and frigatebirds. Enjoy lunch on board the yacht as you return to Santa Cruz Island and to your hotel. Full Day Itinerary: Take a leisurely hike along a comfortable footpath for about 45 minutes to reach Tortuga Bay. Here you can relax on the beach, rest on the white sand or take a swim. In this area, you may also encounter iguanas, sea turtles and pelicans. Return by speedboat to Puerto Ayora and enjoy the rest of the day at leisure. Additional full day trips to other islands are available locally. Full Day Itinerary: After breakfast, drive back to Itabaca Channel, cross by ferry to Baltra Island and take your flight back to Quito. At Quito airport, relax and enjoy the amenities at the Layover Stay lounge until it is time to board your overnight return flight to the USA. Swissotel Quito is one of the city’s top luxury hotels, located in the commercial and residential area of the Floresta neighborhood. Experience the warmest of welcomes when you visit the 4-star Wyndham Quito Airport hotel. With a prime location at the Mariscal Sucre International Airport (UIO), the Wyndham Quito Airport is your top choice for an overnight stopover or day-room in transit. From the moment you step into the lobby, you will find impeccable services and amenities. Relax in your well-appointed room, indulge in the finest international dishes at the onsite restaurant or meet up with friends at the lobby bar for a signature cocktail. The Manatee Amazon Explorer provides a beautiful way to explore and discover the Ecuadorian Amazon. With cruises from Coca, on the Napo River, this expedition vessel allows you to reach many parts of the jungle that would otherwise be inaccessible, and discover the vast biodiversity that inhabits this part of the world’s largest rainforest.